Shri Devi ji kehne lagi - parvatraj ! is prakaar yog yukt hokar mujh brahmswaroop devi ka dhyan kare. In the lines above Devi ji is talking about worshipping her. Devi ji says, in this way with full concentration meditate on me. In the following lines Shri Devi ji gives a vivid description of "that Brahm"
Somya ! us vedhne yogya lakshya ka tum vedhan karo - man lagakar usmein tanmay ho jao. Somya ! upanishad mein .... ......us baan ko kheench kar us Akshar roop Brahm ko hi lakshay bana kar vedhan karo. Pranav (Om) dhanush hai, jeevatma baan hai aur Brahm ko uska lakshya kaha jaata hai. 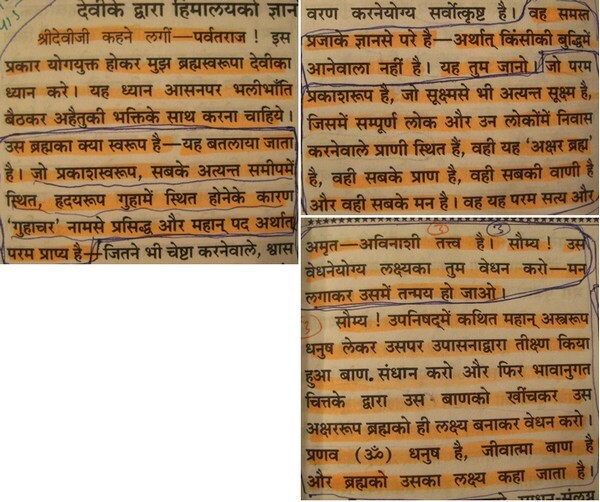 In the following lines Devi ji is very clearly describing about the worship of "that Brahm" and not herself. Is aatmaka 'Om' ke jap ke saath dhyaan karo. Is se agyanmay andhkarse sarvatha parey aur sansar-samudr se us paar jo Brahm hai, usko paa jaoge. Tumhara kalyan ho. Here Devi ji is very clearly describing about the 'One Parmatma' and is saying clearly about doing the worship of some other God. 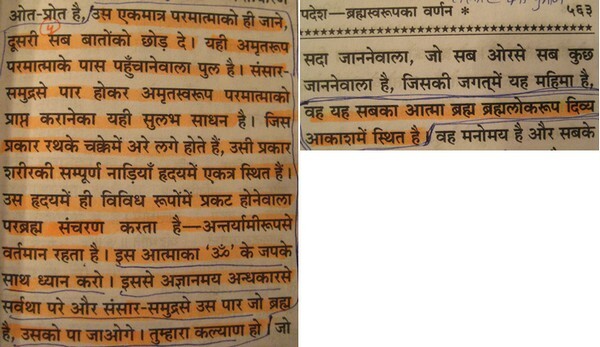 Then Devi ji says in the following lines that, that Brahm lives in Brahmlok. Veh yeh sabka aatma Brahm, Brahmlok roop divya akaash mein stith hai. In Gita Adhyay 8, shlok 16 it is written that even Brahmlok is destructible which means that even Brahm is not the Supreme God. This proves that even Durga does not have the complete knowledge about the Supreme God.